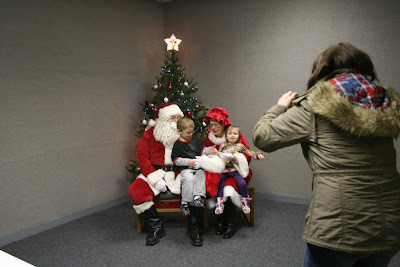 Melanie Ruhl tries to get a picture in fast before the kids lose interest in Santa. was invited to sit with Santa and Mrs. Claus for a visit before receiving a bag of goodies and a beanie baby. After visiting with Santa the kids gathered to play Christmas Bingo for quarters. The kids and the parents had a great time getting a bingo on the special Christmas cards.